Back in vacation land, with only one more stop left on our itinerary for Yellowstone National Park, we woke up early on Friday morning, checked out of the hotel, packed up the car, and made our way to the Grand Canyon of Yellowstone. 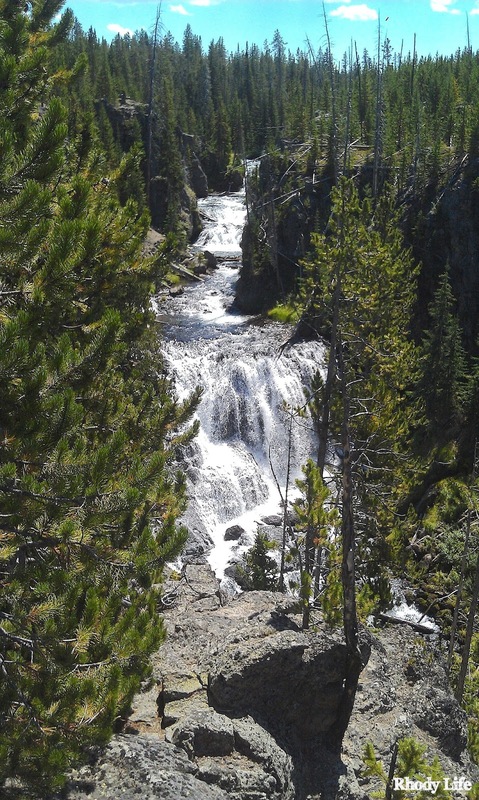 The Grand Canyon of Yellowstone is a large canyon in the middle of the park, where the river has run through creating a valley in the middle, and making gorgeous waterfalls over the rock structures. It's really beautiful, and is surrounded by these amazing cliffs that have pine trees growing out of the sides. There are a few different spots that you can get out of your vehicle and walk along the side of the canyon to get a good look at the waterfalls. Waterfalls are not something that we really have much of in Rhode Island, never mind waterfalls of this size, so seeing these was incredible. Even being that far away from them, you could hear the water running down the rocks. You can only take so many pictures of the canyon before things become repetitive and boring, so when we saw a large tour group coming, we took that as a hint, and decided our time here was done. Because we left the Grand Canyon of Yellowstone earlier than anticipated, we ended up with a little extra time on our hands before we had to exit the park, so I requested that we go back to one of the sights we had seen previously. Can you guess which one? 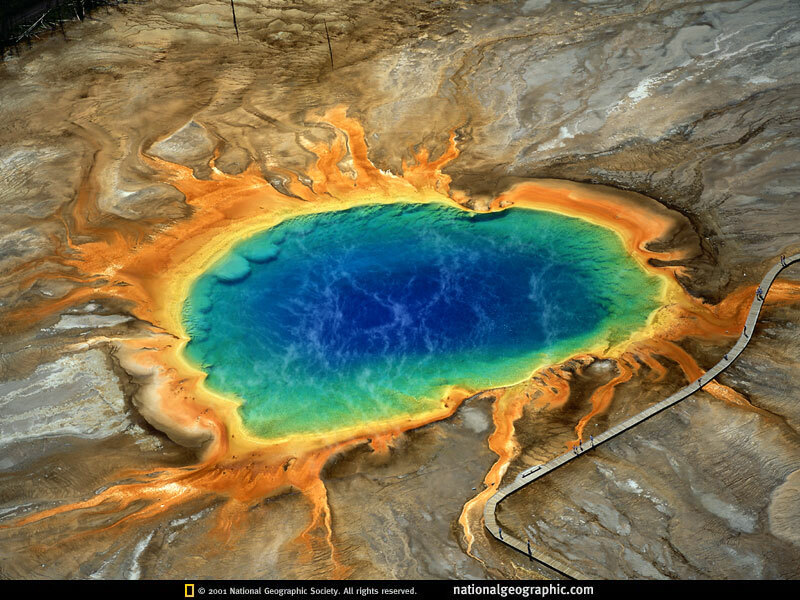 If you guessed Grand Prismatic, you would be correct! As you know, I was so disappointed that we were unable to see what it truly looks like since it was so cold out that morning, so with the temperatures in the air getting into the 60s at this point, I was really hoping that the steam wouldn't be as dense coming off of the water and we would be able to see the colors on the hot spring. 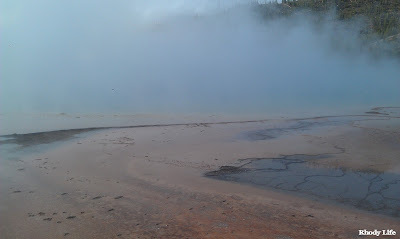 As we got to that area of the park again, we were able to see the small bacteria waterfall that is created by the run off of all the hot springs that are situated on top of the sulfur plateau. 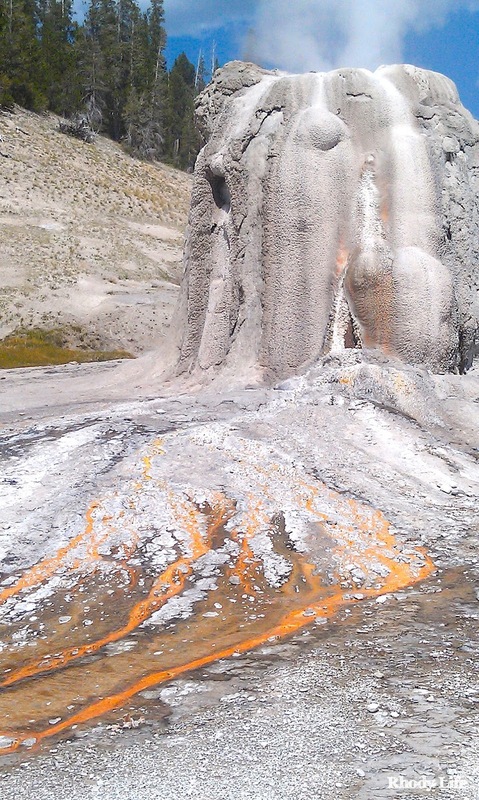 Like the bacteria at Lonestar Geyser, this bacteria was orange, and the hot water ran into a cold water river. We walked up the boardwalk towards the hot springs, and it was like we were at a completely different place than we were at a few days prior. You could actually see! And the first thing that was saw was Excelsior Crater, which had the most amazing turquoise color and water that was so clear you could see the bottom. 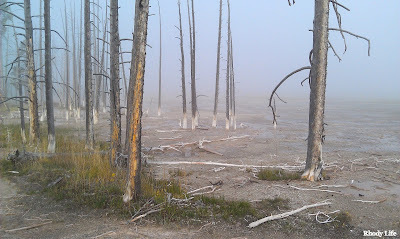 We followed the boardwalk around the hot springs, but this time, we went the opposite direction so that we would hit Grand Prismatic Spring first instead of last. But, when we rounded the corner and got up the slight incline, what we saw was incredible. There was so little steam coming off the water that we could see all the colors. The orange bacteria was on the outside, followed by the yellow, then the green, and finally the blue with the slightest hint of purple in the center and just below the surface of the water. I could not be happier that I requested to revisit this part of the park. The weather was beautiful and cooperative, and seeing the natural colors of the water was gorgeous. Even the other smaller hot springs had much better colors than a few days prior, and those were not only smaller, but closer to us. 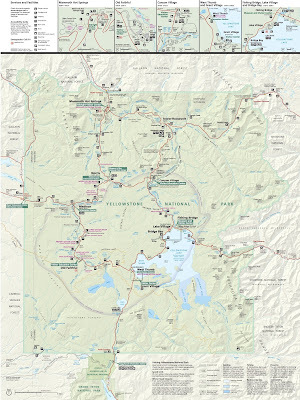 With that last stop out of the way, it was finally time to leave Yellowstone National Park to make our way into the Grand Tetons and down to Jackson Hole, Wyoming. 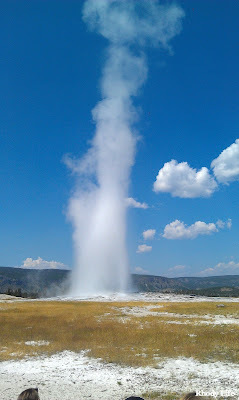 I do, however, have one last Yellowstone post for you, though, so stay tuned, because this one may be the most fun! 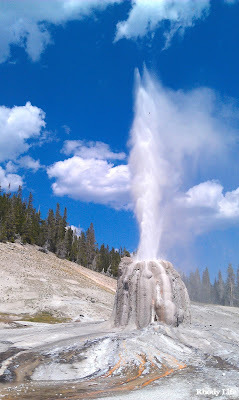 What do you think my last post on Yellowstone is about? Have you noticed anything in my recaps that has been missing? One of my favorite color pairings is green and blue, so when I saw this week's flash sales, I knew that was the color combination I wanted to use. I started looking through all of the sales and fell in love with the bed frame I posted below. I have a weakness for tufting, and a big upholstered headboard is just so luxurious looking. The gray was a neutral, so I knew I could pair it with the green and blue, and thus began the working of this bedroom. I found two different area rugs - one for around the bed and one for around the sitting area, because that chair?! Wow, I just want to buy two of them and not have a place to put them in my house! And then when I came across the ottoman, I thought that those two pieces put together would be great for a little sitting area in a master bedroom. This room has a lot of different patterns going on, but they all seem to complement each other, and for the most part, things all go back to stripes. There are stripes on the gray rug, stripes on the lampshade, on the chair, and even on the bedding! I would love to have this room in my house. It just looks so comfortable, and since the colors are very simple and traditional, you could play around with other patterns to make it a little more modern. I really enjoy making these inspiration boards. I wish there was a way for me to actually see the rooms in real life. I think they would end up looking so good! What do you think of this color combination? Are blues and greens together one of your favorites too? What pattern would you add in with the stripes? Paisley? Ikat? Chevron? I'm taking a time-out from my vacation recaps just to show you something awesome. When I left for vacation in early August, the Avocado pit that I planted back in May had finally begun to sprout, and was about an inch tall. Having forgot about it just after we returned, since we were trying to get back into routine, my mom asked me one day after work if I had seen it since I returned. I answered no, and she took me by the hand and brought me into the other room, where I had placed the glass vase on the fireplace mantle. Walking in, it was dark, so I couldn't see it right away, but when she turned on the lights, I saw how much it had grown. Yes, it was that big! I couldn't believe it! It grew over an inch a day in the time that I was gone! Plus, the leaves weren't small - they were really big! I didn't think I would have this kind of growth for months, never mind it happening essentially in ten days! I started doing research on how to care for am adolescent avocado tree, and everything that I read talked about pinching. Initially, I was confused by the term "pinching," but I figured out that what they meant is to cut off the top of the plant to begin the growth of new branches. By pinching off the top set of leaves, it tricks the plant to begin a new sub-stem, which just ends up being a branch that will grow leaves, instead of only having leaves coming off of the main branch. I just recently did this, after waiting for a few more leaves to show up, so I'm not a part of the waiting game for the tree to start its new branches. I'm really hoping that this works, because having a nice full tree would be great! I also read that you can try to put the leaf and bud into a small glass of water to see if it starts to sprout roots, so I did that and we'll see what happens. I doubt that it will survive and start to grow, but it can't hurt to try, right? And now that I know that I can grow a tree from an avocado pit, I may just start a few more just so I have some nice green in the home. After all, I do have eleven more of those vases leftover from the wedding centerpieces, so I may as well just put them to use! Have you successfully grown an avocado tree? What did you do to help it branch out? Unlike last week, I found so many things that I loved on the Flash Sale sites this week. I really wanted to be able to use more of the items for sale, but I couldn't come up with a good design for a room with everything that I fell in love with. However, I think that this week's room that I designed for you is absolutely stunning! With the transition into fall, I have been loving dark yet still vivid colors, like purple and teal, and those two colors go together very well. They are very saturated colors, so I decided to add in a bright neutral, bringing in silver tones to even out the color palette. But, don't worry, because if silver isn't your color, gold or even copper would go very well in this space too. One of my favorite items in this room, other than the rug, of course, is the wallpaper. I love the dark teal color that is under the silver pattern, and I think that putting that on a feature wall would look incredible! The other great thing about that wallpaper is that it's not permanent, so this would work perfectly in a rental space, or even in a property you own - yet it's so simple to just take down and replace with another pattern. Doesn't this room just scream elegance and luxury?! I love the way that the teal and the purple look together, and the color on the walls is just so soft, yet helps the other colors really pop and stand out without being too bright. Would you pair these colors together in your home? What piece from this collection do you want the most? Are you daring enough to put purple on the walls in your home - and not in a child's bedroom? Our second day in Yellowstone, we drove to the North Entrance of the Park, which is technically in Montana. Up in this area of the park is Mammoth Hot Springs, one of the places that I suggested that we go, even though the drive up there from the hotel is over an hour and a half. It's crazy to think that this park is larger than the entire State of Rhode Island. 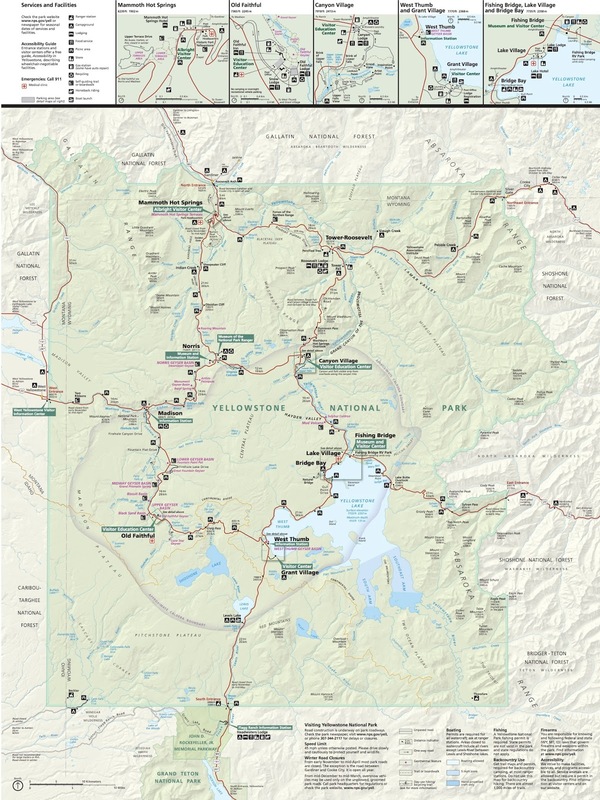 In fact, the road that makes a circle in the center of the park just to the Northwest of Lake Yellowstone is only 40 miles shorter than the perimeter of Rhode Island. On our way up to Mammoth Hot Springs, we stopped at Mud Volcano, to see Dragon's Mouth, which is a cave that has boiling water coming out of it. When the original settlers of the area came upon this cave, they had thought that there was a Dragon that lived inside, because of the steam coming out of it and the roaring noise that the boiling water was making as it was coming out. The cave was very neat to see, but once again, with the morning temperature being in the low 40s, it was difficult to see the actual cave with all of the steam coming out of it, but the actual concept of the cave was very cool. It's just amazing that boiling water can come out of the Earth, naturally. In that same area of the park are some other hot springs, some of which are really large and others that are on the small side. From the top of the hill in that area, you could see the steam from all of the hot springs because it was so cold outside, and it was a really neat view with the mountains in the background. 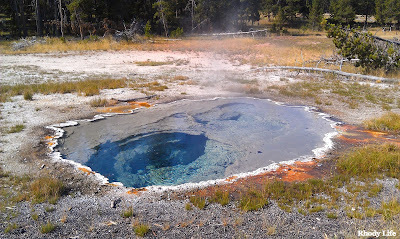 The hot springs that were smaller were much more interesting to me than the large ones were, mostly because they were surrounded by beautifully colored grasses that I was surprised could survive near the hot sulfur-infused water. Also in this area were the Mud Volcanoes, which instead of just water boiling, these are mud ponds that boil. Seeing mud boil was actually a really weird thing to see. You don't really think about boiling things with the consistency of mud, at least I don't, so actually seeing it boil is a strange occurrence. The cool thing about it, though, is that the boiling seems to be slow, and not as rapid, which means that when you take pictures, you can actually see the ripples and the bubbles in the boil. 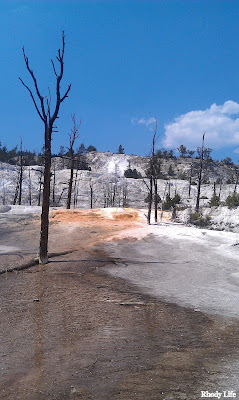 Next, we finally arrived at Mammoth Hot Springs, where we saw some geysers, similar to the ones in the Old Faithful area of the park, and the hot springs, which over thousands of years, have formed a large sulfur mountain. 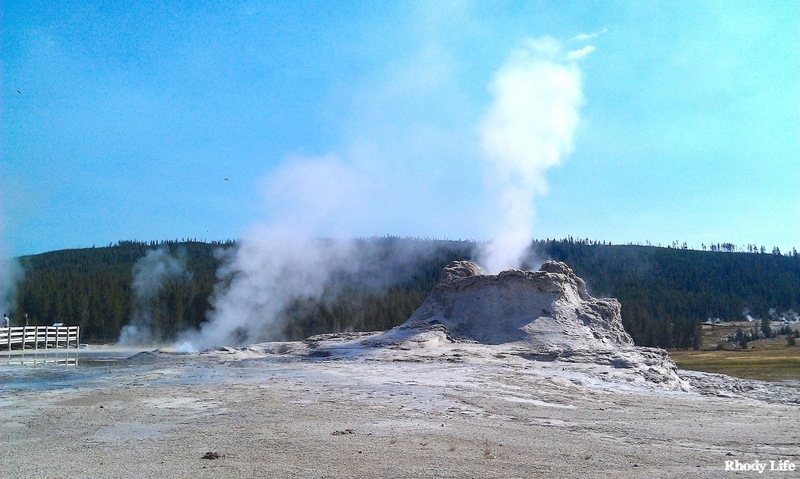 Like the sulfur in the geysers, there is also a lot of sulfur in the water in the hot springs, and as the water boils, a buildup of sulfur is created, making the white-faced mountain that you see in the picture below. From far away, it looks like it was snow covered mountain, which I thought could be possible considering that it was getting so cold at night, but I was proved very wrong when we got closer. 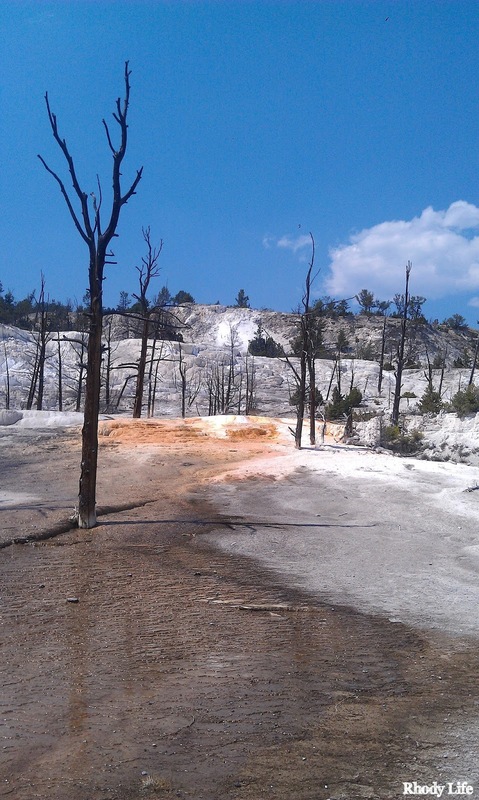 This mountain of sulfur was created from some of the larger hot springs, and the sulfur has actually killed the nature that is around that area. Small grasses are able to survive, but trees that once stood with green leaves and branches are now just dead sticks that are being held up by the hardened sulfur around the trunks. It's actually a really interesting thing to see, and makes the hot springs just seem a little more ominous. Over time, as long as these trees stay standing, they will likely petrify because of the acids and the minerals in the water. It will take millions of years for this to occur, however, so unless technology really advances in the next fifty years or so, we will never live to see it happen. After spending the morning and early afternoon at Mammoth Hot Springs, we started our trek back to the hotel, stopping on our way to see the Petrified Tree. This tree is over 40 million years old, and at one point there were three of them this size that were all situated next to each other on this hillside of Specimen Ridge. The other two trees were more accessible than this one, and tourists were picking them apart, taking pieces of the petrified wood as souvenirs. This led to the park association fencing in the last remaining tree to preserve it. It was a beautiful landmark, but it was difficult to get a good view of it, as you can kind of tell from the picture below - it's situated on the side of a ridge, and there is a small walkway that allows you to see it, although it is a little further up the hill, making for difficult photo taking. We hit some road construction on the way back to the hotel, which ended up delaying us slightly for our dinner reservation, and we didn't get much of a chance to do some hiking. 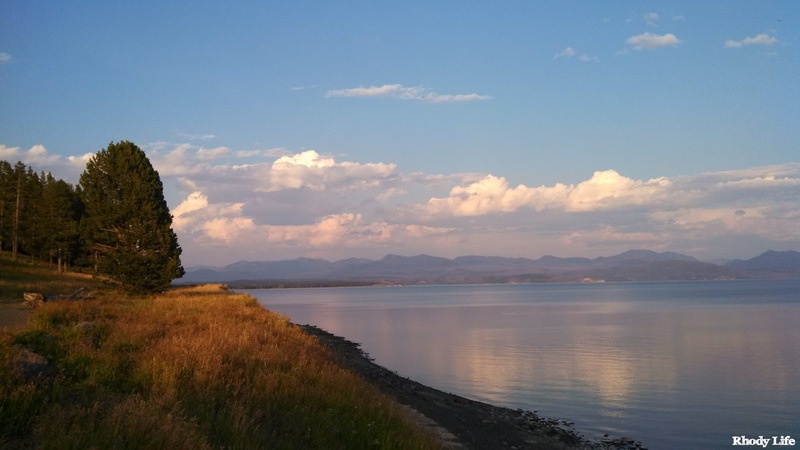 Instead, we got cleaned up and had dinner, just in time to watch the gorgeous sunset over Lake Yellowstone. It was the perfect ending to a great day in the park, and our last night there as well, but the recaps of Yellowstone aren't over yet. 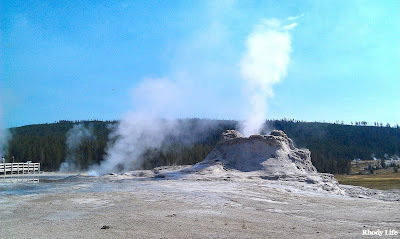 In fact, stay tuned for two more posts about Yellowstone, one of which is my absolute favorite part of the park, and then we travel to Jackson Hole, Wyoming and the Grand Tetons for a few days. I'm going to honest with you this week. I had a really hard time and very little motivation in this week's Flash Sale Friday. It wasn't because I don't enjoy blogging or making up this post for you all every week - it's because I really didn't like all that much on the flash sale sites this week. Nothing really spoke to me, and I couldn't even really find different pieces that I wanted to incorporate into a room for you. So I came up with something different. The one similarity that I found with a few of the pieces on the flash sale sites is wood. The pieces of wood don't necessarily all go together, but I figured I would show you how you can incorporate something natural looking and made of wood into your space. There are a bunch of different options in terms of tables, chairs that are upholstered but have just a hint of wood on them, and even lamps for a side table or bureau. I really hope that you find something in this week's Flash Sale Friday that you like, and I'm really hoping that there are some great pieces for me to feature for you next week. What traditional or non-traditional ways have you used wood in your home decor?